Medium: Screen print on glass. 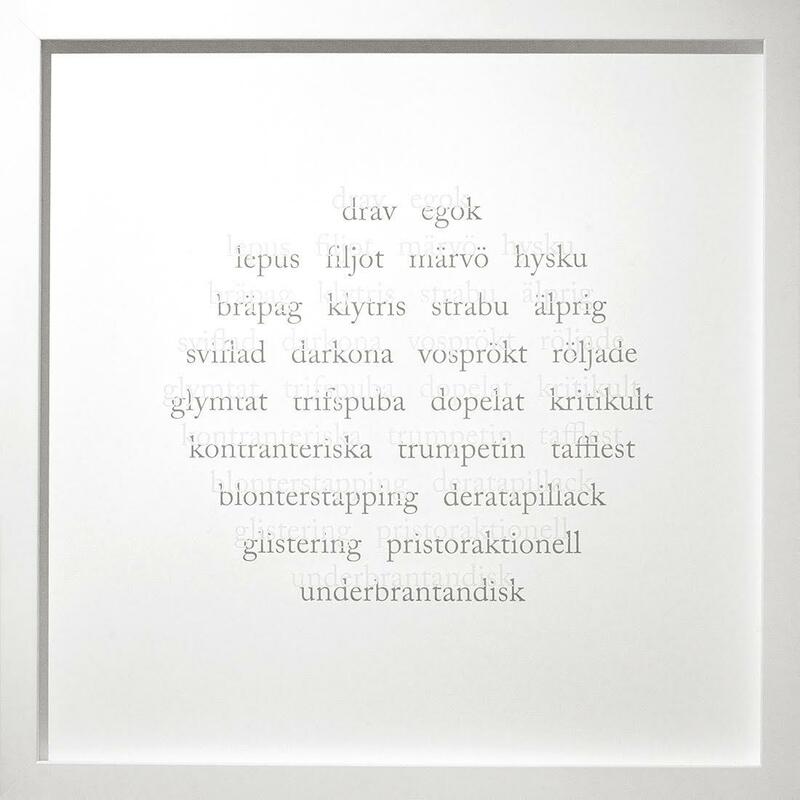 In Grammar, Pernilla Zetterman explores questions of language, communication and codification. As a starting point she used her own relationship to speech and writing, as well as the challenge of a foreign language and the possibility of human understanding and misunderstanding. Grammar consists of word combinations from a study on dyslexia, as well as photographs and a video work in which she experiments with visualising vulnerability, trust and introversion. Pernilla Zetterman’s work has been shown extensively in solo and group exhibitions, including the recent touring exhibition, The Helsinki School, and is represented in the permanent collections of Fotomuseum Winterthur and Hasselblad Foundation, among others. In When, Zetterman explores behavioural patterns, structures, obsessions and the origins and contours of identity. A study of three generations, Zetterman photographed part of the series in her grandmother’s home, her mother’s and her own, examining the things each woman collects and holds dear or leaves to decay. In Ground Rules, Zetterman uses her former training as a track and field athlete as the backdrop to investigate issues of performance, control, motivation and regimentation. Here, as in When and much of Zetterman’s work, we see how the details of a discipline, a sport or a behaviour, act as the grammar for a language to be studied and learned, taught and passed down to future generations – of athletes or daughters. Equestrian culture, and the rites and rituals associated with it, is the focal point of Zetterman´s work Close (2001-2017). In this culture, she finds an environment charged with issues of control, discipline and power, but also of love and trust. Close ups of parts of horses’ bodies express the feelings found in a moment of intimacy and contrast with the stern discipline of whips, reins, bites and other tools of behavioral restraint and modification. Pernilla Zetterman lives and works in Stockholm, Sweden. She studied photography in Sweden and Finland, receiving a postgraduate degree from the University of Art and Design in Helsinki, an MFA from the University College of Arts, Crafts and Design in Stockholm and a BFA from the School of Photography at Göteborgs University.